Bangladesh (/ˌbæŋɡləˈdɛʃ, ˌbɑːŋ-/; Bengali: বাংলাদেশ Bangladesh [ˈbaŋladeʃ] ( listen), lit. "The country of Bengal"), officially the People's Republic of Bangladesh (গণপ্রজাতন্ত্রী বাংলাদেশ Gônoprojatontri Bangladesh), is a sovereign country in South Asia. It shares land borders with India and Myanmar (Burma). The country's maritime territory in the Bay of Bengal is roughly equal to the size of its land area. Bangladesh is the world's eighth most populous country as well as its most densely-populated, to the exclusion of small island nations and city-states. Dhaka is its capital and largest city, followed by Chittagong, which has the country's largest port. Bangladesh forms the largest and easternmost part of the Bengal region. Bangladeshis include people from a range of ethnic groups and religions. Bengalis, who speak the official Bengali language, make up 98% of the population. The politically dominant Bengali Muslims make the nation the world's third largest Muslim-majority country. Islam is the official religion of Bangladesh. Most of Bangladesh is covered by the Bengal delta, the largest delta on Earth. The country has 700 rivers and 8,046 km (5,000 mi) of inland waterways. Highlands with evergreen forests are found in the northeastern and southeastern regions of the country. Bangladesh has many islands and a coral reef. The longest unbroken natural sea beach of the world, Cox's Bazar Beach, is located in the southeast. It is home to the Sundarbans, the largest mangrove forest in the world. The country's biodiversity includes a vast array of plant and wildlife, including endangered Bengal tigers, the national animal. Commonwealth War Cemetery, Chittagong is home to the graves of Allied and Axis soldiers who died during the Burma Campaign. After the 1757 Battle of Plassey, Bengal was the first region of the Indian subcontinent conquered by the British East India Company. The company formed the Presidency of Fort William, which administered the region until 1858. A notable aspect of company rule was the Permanent Settlement, which established the feudal zamindari system. A number of famines, including the great Bengal famine of 1770, occurred under company rule. Several rebellions broke out during the early 19th century (including one led by Titumir), but British rule displaced the Muslim ruling class. A conservative Islamic cleric, Haji Shariatullah, sought to overthrow the British by propagating Islamic revivalism. Several towns in Bangladesh participated in the Indian Mutiny and pledged allegiance to the last Mughal emperor, Bahadur Shah Zafar, who was later exiled to neighbouring Burma. On 3 June 1947 Mountbatten Plan outlined the partition of British India. On 20 June, the Bengal Legislative Assembly met to decide on the partition of Bengal. At the preliminary joint meeting, it was decided (120 votes to 90) that if the province remained united it should join the Constituent Assembly of Pakistan. At a separate meeting of legislators from West Bengal, it was decided (58 votes to 21) that the province should be partitioned and West Bengal should join the Constituent Assembly of India. At another meeting of legislators from East Bengal, it was decided (106 votes to 35) that the province should not be partitioned and (107 votes to 34) that East Bengal should join the Constituent Assembly of Pakistan if Bengal was partitioned. On 6 July, the Sylhet region of Assam voted in a referendum to join East Bengal. Cyril Radcliffe was tasked with drawing the borders of Pakistan and India, and the Radcliffe Line established the borders of present-day Bangladesh. 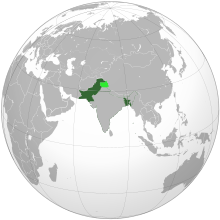 The Dominion of Pakistan was created on 14 August 1947. East Bengal, with Dhaka its capital, was the most populous province of the 1947 Pakistani federation (led by Governor General Muhammad Ali Jinnah, who promised freedom of religion and secular democracy in the new state). East Bengal was also Pakistan's most cosmopolitan province, home to peoples of different faiths, cultures and ethnic groups. Partition gave increased economic opportunity to East Bengalis, producing an urban population during the 1950s. Khawaja Nazimuddin was East Bengal's first chief minister with Frederick Chalmers Bourne its governor. The All Pakistan Awami Muslim League was formed in 1949. In 1950, the East Bengal Legislative Assembly enacted land reform, abolishing the Permanent Settlement and the zamindari system. The 1952 Bengali Language Movement was the first sign of friction between the country's geographically-separated wings. The Awami Muslim League was renamed the more-secular Awami League in 1953. The first constituent assembly was dissolved in 1954; this was challenged by its East Bengali speaker, Maulvi Tamizuddin Khan. The United Front coalition swept aside the Muslim League in a landslide victory in the 1954 East Bengali legislative election. The following year, East Bengal was renamed East Pakistan as part of the One Unit program and the province became a vital part of the Southeast Asia Treaty Organization. 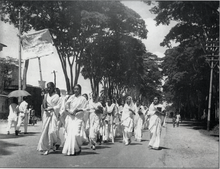 Female students march in defiance of the Section 144 prohibition on assembly during the Bengali Language Movement in early 1953. U.S. Chief Justice Earl Warren meets Maulvi Tamizuddin Khan, the plaintiff in Federation of Pakistan v. Maulvi Tamizuddin Khan. During the Bangladesh Liberation War, Bengali nationalists declared independence and formed the Mukti Bahini (the Bangladeshi National Liberation Army). The Provisional Government of Bangladesh was established on 17 April 1971, converting the 469 elected members of the Pakistani national assembly and East Pakistani provincial assembly into the Constituent Assembly of Bangladesh. The provisional government issued a proclamation that became the country's interim constitution and declared "equality, human dignity and social justice" as its fundamental principles. Due to Mujib's detention, the acting president was Syed Nazrul Islam, while Tajuddin Ahmad was Bangladesh's first prime minister. The military wing of the provisional government was the Bangladesh Forces that included Mukti Bahini and other Bengali guerilla forces. Led by General M. A. G. Osmani and eleven sector commanders, the forces strongly held the countryside during the war and conducted wide-ranging guerrilla operations against Pakistani forces. As a result, almost entire country except capital Dacca was liberated by Bangladesh Forces by late November. This led Pakistan Army to attack neighboring India's western front on 2 December. India retaliated both in western and eastern fronts. By joint Bangladeshi ground advance and Indian air strike, the rest capital Dacca was liberated from Pakistani occupation in mid December. During the last phase of the war, the Soviet Union and the United States dispatched naval forces to the Bay of Bengal in a Cold War standoff. The nine-months long war ended with the surrender of Pakistani armed forces to the Bangladesh-India Allied Forces on 16 December 1971. Under international pressure, Pakistan released Rahman from imprisonment on 8 January 1972 and he was flown by the British Royal Air Force of to a million-strong homecoming in Dacca. Remaining Indian troops were withdrawn by 12 March 1972, three months after the war ended. The rivalry between Hasina and Zia has been dubbed the Battle of the Begums. Economist Fakhruddin Ahmed (far right) led a caretaker government between 2007 and 2008 under a state of emergency. In February 1996, a general election was held which was boycotted by all opposition parties giving a 300 (of 300) seat victory for BNP. This election was deemed illegitimate, so a system of a caretaker government was introduced to oversee the transfer of power and a new election was held in June 1996, overseen by Justice Muhammad Habibur Rahman, the first Chief Adviser of Bangladesh. The Awami League won the seventh general election, marking its leader Sheikh Hasina's first term as Prime Minister. Hasina's first term was highlighted by the Chittagong Hill Tracts Peace Accord and a Ganges water-sharing treaty with India. The second caretaker government, led by Chief Adviser Justice Latifur Rahman, oversaw the 2001 Bangladeshi general election which returned Begum Zia and the BNP to power. The second Zia administration saw improved economic growth, but political turmoil gripped the country between 2004 and 2006. A radical Islamist militant group, the JMB, carried out a series of terror attacks. The evidence of staging these attacks by these extremist groups have been found in the investigation, and hundreds of suspected members were detained in numerous security operations in 2006, including the two chiefs of the JMB, Shaykh Abdur Rahman and Bangla Bhai, who were executed with other top leaders in March 2007, bringing the militant group to an end. In 2006, at the end of the term of the BNP administration, there was widespread political unrest related to the handover of power to a caretaker government. As such, the Bangladeshi military urged President Iajuddin Ahmed to impose a state of emergency and a caretaker government, led by technocrat Fakhruddin Ahmed, was installed. Emergency rule lasted for two years, during which time investigations into members of both Awami League and BNP were conducted, including their leaders Sheikh Hasina and Khaleda Zia. In 2008 the ninth general election saw a return to power for Sheikh Hasina and the Awami League led Grand Alliance in a landslide victory. In 2010, the Supreme Court ruled martial law illegal and affirmed secular principles in the constitution. The following year, the Awami League abolished the caretaker-government system. Citing the lack of caretaker government the 2014 general election was boycotted by the BNP and other opposition parties, giving the Awami League a decisive victory. The election was controversial with reports of violence and an alleged crackdown on the opposition in the run-up to the election and 153 seats (of 300) went uncontested in the election. Despite the controversy Hasina went on to form a government which saw her return for a third term as Prime Minister. Due to strong domestic demand, Bangladesh emerged as one of the fastest-growing economies in the world. However, human rights abuses increased under the Hasina administration, particularly enforced disappearances. Between 2016 and 2017, an estimated 1 million Rohingya refugees took shelter in southeastern Bangladesh amid a military crackdown in neighbouring Rakhine State, Myanmar. In 2018, the country saw major movements for government quota reforms and road-safety. The Bangladeshi general election, 2018 was marred by allegations of widespread vote rigging. The Awami League won 259 out of 300 seats and the main opposition alliance Jatiya Oikya Front secured only 8 seats, with Sheikh Hasina becoming the longest serving prime minister in Bangladeshi history. Pro-democracy leader Dr. Kamal Hossain called for an annulment of the election result and for a new election to be held in a free and fair manner. The election was also criticized by the United States and the European Union, the largest export markets and foreign investment sources for Bangladesh. Köppen-Geiger climate classification map for Bangladesh. In September 1998, Bangladesh saw the most severe flooding in modern world history. As the Brahmaputra, the Ganges and Meghna spilt over and swallowed 300,000 houses, 9,700 km (6,000 mi) of road and 2,700 km (1,700 mi) of embankment, 1,000 people were killed and 30 million more were made homeless; 135,000 cattle were killed; 50 km2 (19 sq mi) of land were destroyed; and 11,000 km (6,800 mi) of roads were damaged or destroyed. Effectively, two-thirds of the country was underwater. The severity of the flooding was attributed to unusually high monsoon rains, the shedding of equally unusually large amounts of melt water from the Himalayas, and the widespread cutting down of trees (that would have intercepted rain water) for firewood or animal husbandry. Bangladesh is now widely recognised to be one of the countries most vulnerable to climate change. Natural hazards that come from increased rainfall, rising sea levels, and tropical cyclones are expected to increase as climate changes, each seriously affecting agriculture, water and food security, human health, and shelter. It is estimated that by 2050, a 3 feet rise in sea levels will inundate some 20 percent of the land and displace more than 30 million people. Bangladesh ratified the Rio Convention on Biological Diversity on 3 May 1994. As of 2014[update], the country was set to revise its National Biodiversity Strategy and Action Plan. Several animals became extinct in Bangladesh during the last century, including the one horned and two horned rhinoceros and common peafowl. The human population is concentrated in urban areas, hence limiting deforestation to a certain extent. Rapid urban growth has threatened natural habitats. Although many areas are protected under law, a large portion of Bangladeshi wildlife is threatened by this growth. The Bangladesh Environment Conservation Act was enacted in 1995. The government has designated several regions as Ecologically Critical Areas, including wetlands, forests and rivers. The Sundarbans tiger project and the Bangladesh Bear Project are among the key initiatives to strengthen conservation. The Constitution of Bangladesh established a unitary, Westminster-style parliamentary republic with universal suffrage. A member of parliament supported by a parliamentary majority (usually the chair of the largest party) is the Prime Minister, the head of government and of the cabinet. Bangladesh is governed by a 350-member parliament, known as the Jatiyo Sangshad. Three hundred of its members are elected on a first past the post basis, and 50 seats are reserved for female nominees by political parties. Although parliamentary elections are scheduled every five years, they have often been delayed by political crises, emergency rule or martial law. The President of Bangladesh is the head of state. From 1975 to 1990 the presidency had executive powers, but it has been reduced to a largely-ceremonial role by the Twelfth Amendment to the constitution. Since 1991, the Bangladesh Nationalist Party (BNP), and the Bangladesh Awami League, have been the two major political parties in Bangladesh and have engaged in bitter rivalries and skirmishes. First South Asian Association for Regional Cooperation (SAARC) meeting in 1985 in Dhaka (l-r, top row: the presidents of Pakistan and the Maldives, the king of Bhutan, the president of Bangladesh, the prime minister of India, the king of Nepal and the president of Sri Lanka). Japan is Bangladesh's largest economic-aid provider, and the countries have common political goals. The United Kingdom has longstanding economic, cultural and military links with Bangladesh. The United States is a major economic and security partner, including its largest export market and foreign investor. Seventy-six percent of Bangladeshis viewed the United States favorably in 2014, one of the highest ratings among Asian countries. The United States views Bangladesh as a key partner in the Indo-Pacific. The European Union is Bangladesh's largest regional market, conducting public diplomacy and providing development assistance. Bangladeshi law-enforcement agencies, including the Rapid Action Battalion (pictured), have been accused of human-rights abuses. Dhaka, the commercial and financial hub of the country, is the largest economic centre in eastern South Asia. Muhammad Yunus and the Grameen Bank, pioneers of microcredit in the developing world, won the Nobel Peace Prize in 2006. Bangladesh, a developing country with a market-based mixed economy, is one of the Next Eleven emerging markets. Its per-capita income was US$1,190 in 2018, with a GDP of $285 billion. Bangladesh has the third-largest South Asian economy (after India and Pakistan) and the second-highest foreign-exchange reserves (after India). The Bangladeshi diaspora contributed $15.31 billion in remittances in 2015. During its first five years of independence Bangladesh adopted socialist policies. The subsequent military regime and BNP and Jatiya Party governments restored free markets and promoted the country's private sector. In 1991, finance minister Saifur Rahman introduced a programme of economic liberalization. The Bangladeshi private sector has rapidly expanded, with a number of conglomerates driving the economy. Major industries include textiles, pharmaceuticals, shipbuilding, steel, electronics, energy, construction materials, chemicals, ceramics, food processing and leather goods. Export-oriented industrialization has increased, with fiscal year 2014–15 exports increasing by 3.3% over the previous year to $30 billion, although Bangladesh's trade deficit ballooned by over 45% in this same time period. Most export earnings are from the garment-manufacturing industry. Bangladesh also has social enterprises, including the Nobel Peace Prize-winning Grameen Bank and BRAC (the world's largest non-governmental organisation). The country is notable for its soil fertility land, including the Ganges Delta, Sylhet Division and the Chittagong Hill Tracts. Agriculture is the largest sector of the economy, making up 18.6 percent of Bangladesh's GDP in November 2010 and employing about 45 percent of the workforce. The agricultural sector impacts employment generation, poverty alleviation, human resources development and food security. More Bangladeshis earn their living from agriculture than from any other sector. The country is among the top producers of rice (fourth), potatoes (seventh), tropical fruits (sixth), jute (second), and farmed fish (fifth). Bangladesh is the seventh-largest natural gas producer in Asia, ahead of neighboring Myanmar, and 56 percent of the country's electricity is generated by natural gas. Major gas fields are located in the northeastern (particularly Sylhet) and southern (including Barisal and Chittagong) regions. Petrobangla is the national energy company. The American multinational corporation Chevron produces 50 percent of Bangladesh's natural gas. According to geologists, the Bay of Bengal contains large, untapped gas reserves in Bangladesh's exclusive economic zone. 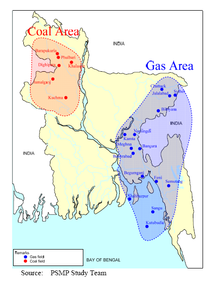 Bangladesh has substantial coal reserves, with several coal mines operating in the northwest. Jute exports remain significant, although the global jute trade has shrunk considerably since its World War II peak. Bangladesh has one of the world's oldest tea industries, and is a major exporter of fish and seafood. Estimates of the Bangladeshi population vary, but UN data suggests 162,951,560 million. The 2011 census estimated 142.3 million, much less than 2007–2010 estimates of Bangladesh's population (150–170 million). Bangladesh is the world's eighth-most-populous nation. In 1951, its population was 44 million. Bangladesh is the most densely-populated large country in the world, ranking 11th in population density when small countries and city-states are included. The country's population-growth rate was among the highest in the world in the 1960s and 1970s, when its population grew from 65 to 110 million. With the promotion of birth control in the 1980s, Bangladesh's growth rate began to slow. Its total fertility rate is now 2.55, lower than India's (2.58) and Pakistan's (3.07). The population is relatively young, with 34 percent aged 15 or younger and five percent 65 or older. Life expectancy at birth was estimated at 70 years in 2012. According to the World Bank, as of 2016[update] 14.8% of the country lives below the international poverty line on less than $1.90 per day. Rohingya refugees in Bangladesh number at around 1 million, making Bangladesh one of the countries with the largest refugee populations in the world. Dhaka is Bangladesh's capital and largest city. There are 12 city corporations which hold mayoral elections: Dhaka South, Dhaka North, Chittagong, Comilla, Khulna, Mymensingh, Sylhet, Rajshahi, Barisal, Rangpur, Gazipur and Narayanganj. Mayors are elected for five-year terms. Altogether there are 506 urban centres in Bangladesh among which 43 cities have a population of more than 100000. Islam is the largest and the official state religion of Bangladesh, followed by 90.4 percent of the population. The country is home to most Bengali Muslims, the second-largest ethnic group in the Muslim world. The vast majority of Bangladeshi Muslims are Sunni, followed by tiny minorities of Shia and Ahmadiya. About four percent are non-denominational Muslims. Bangladesh has the fourth-largest Muslim population in the world, and is the third-largest Muslim-majority country (after Indonesia and Pakistan). Sufism has a lengthy heritage in the region. The largest gathering of Muslims in Bangladesh is the Bishwa Ijtema, held annually by the Tablighi Jamaat. The Ijtema is the second-largest Muslim congregation in the world, after the Hajj. Universities in Bangladesh are of three general types: public (government-owned and -subsidized), private (privately owned universities) and international (operated and funded by international organizations). Bangladesh has 34 public, 64 private and two international universities; Bangladesh National University has the largest enrollment, and the University of Dhaka (established in 1921) is the oldest.University of Chittagong (established in 1966) is the largest University (Campus: Rural, 2,100 acres (8.5 km2)) . Islamic University of Technology, commonly known as IUT, is a subsidiary of the Organisation of the Islamic Cooperation (OIC, representing 57 countries in Asia, Africa, Europe and South America). Asian University for Women in Chittagong is the preeminent South Asian liberal-arts university for women, representing 14 Asian countries; its faculty hails from notable academic institutions in North America, Europe, Asia, Australia and the Middle East. BUET, CUET, KUET and RUET are Bangladesh's four public engineering universities. BUTex and DUET are two specialized engineering universities; BUTex specializes in textile engineering, and DUET offers higher education to diploma engineers. The NITER is a specialized public-private partnership institute which provides higher education in textile engineering. Science and technology universities include SUST, PUST, JUST and NSTU. Bangladeshi universities are accredited by and affiliated with the University Grants Commission (UGC), created by Presidential Order 10 in 1973. The oldest evidence of writing in Bangladesh is the Mahasthan Brahmi Inscription, which dates back to the 3rd century BCE. In the Gupta Empire, Sanskrit literature thrived in the region. Bengali developed from Sanskrit and Magadhi Prakrit in the from the 8th to 10th century. Bengali literature is a millennium-old tradition; the Charyapadas are the earliest examples of Bengali poetry. Sufi spiritualism inspired many Bengali Muslim writers. During the Bengal Sultanate, medieval Bengali writers were influenced by Arabic and Persian works. The Chandidas are the notable lyric poets from the early Medieval Age. Syed Alaol was a noted secular poet and translator from the Arakan region. The Bengal Renaissance shaped the emergence of modern Bengali literature, including novels, short stories and science fiction. Rabindranath Tagore was the first non-European laureate of the Nobel Prize in Literature and is described as the Bengali Shakespeare. Kazi Nazrul Islam was a revolutionary poet who espoused political rebellion against colonialism and fascism. Begum Rokeya is regarded as the pioneer feminist writer of Bangladesh. Other renaissance icons included Michael Madhusudan Dutt and Sarat Chandra Chattopadhyay. The writer Syed Mujtaba Ali is noted for his cosmopolitan Bengali worldview. Jasimuddin was a renowned pastoral poet. Shamsur Rahman was the poet laureate of Bangladesh for many years. Al Mahmud is considered one of the greatest Bengali poets to have emerged in the 20th century. Farrukh Ahmed, Sufia Kamal, and Nirmalendu Goon are important figures of modern Bangladeshi poetry. Ahmed Sofa is regarded as the most important Bangladeshi intellectual in the post-independence era. Humayun Ahmed was a popular writer of modern Bangladeshi magical realism and science fiction. Notable writers of Bangladeshi fictions include Mir Mosharraf Hossain, Akhteruzzaman Elias, Syed Waliullah, Shahidullah Kaiser, Shawkat Osman, Selina Hossain, Taslima Nasreen, Haripada Datta, Razia Khan, Anisul Hoque, and Bipradash Barua. Many Bangladeshi writers, such as Muhammad Zafar Iqbal, and Farah Ghuznavi are acclaimed for their short stories. Although, as of 2015[update], several women occupied major political office in Bangladesh, its women continue to live under a patriarchal social regime where violence is common. Whereas in India and Pakistan women participate less in the workforce as their education increases, the reverse is the case in Bangladesh. Ayub Bachchu performing at a concert. The music of Bangladesh features the Baul mystical tradition, listed by UNESCO as a Masterpiece of Intangible Cultural Heritage. Numerous lyric-based musical traditions, varying from one region to the next, exist, including Gombhira, Bhatiali and Bhawaiya. Folk music is accompanied by a one-stringed instrument known as the ektara. Other instruments include the dotara, dhol, flute, and tabla. Bengali classical music includes Tagore songs and Nazrul geeti. Bangladesh has a rich tradition of Indian classical music, which uses instruments like the sitar, tabla, sarod and santoor. Musician Ayub Bachchu is credited with popularizing Bengali rock music in Bangladesh. A woman wearing jamdani in 1787. 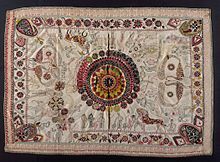 Bengal has manufactured textiles for many centuries, as recorded in ancient hand-written and printed documents. The team has been more successful in One Day International cricket (ODI). They reached the quarter-final of the 2015 Cricket World Cup. They also reached the semi-final of the 2017 ICC Champions Trophy. They whitewashed Pakistan in a home ODI series in 2015 followed by home ODI series wins against India and South Africa. They also won home ODI series by 4–0 in 2010 against New Zealand and whitewashed them in the home ODI series in 2013. In July 2010, they celebrated their first-ever win over England in England. In late 2012, they won a five-match home ODI series 3-2 against a full-strength West Indies National team. 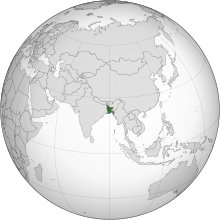 In 2011, Bangladesh successfully co-hosted the ICC Cricket World Cup 2011 with India and Sri Lanka. They also hosted the 2014 ICC World Twenty20 championship. Bangladesh hosted the Asia Cup on four occasions in 2000, 2012, 2014, and 2016. In 2012 Asia Cup, Bangladesh beat India and Sri Lanka but lost the final game against Pakistan. However, it was the first time Bangladesh had advanced to the final of any top-class international cricket tournament. They reached the final again at the 2016 Asia Cup and 2018 Asia Cup. They participated at the 2010 Asian Games in Guangzhou, defeating Afghanistan to claim their Gold Medal in the first-ever cricket tournament held in the Asian Games. Bangladeshi cricketer Sakib Al Hasan is No.1 on the ICC's all-rounder rankings in all three formats of the cricket. Kabaddi—very popular in Bangladesh—is the national game. Other popular sports include field hockey, tennis, badminton, handball, football, chess, shooting, angling. The National Sports Council regulates 42 different sporting federations. On 4 November 2018, Bangladesh national under-15 football team won the 2018 SAFF U-15 Championship, defeating Pakistan national under-15 football team in the final. Bangladesh has five grandmasters in chess. Among them, Niaz Murshed was the first grandmaster in South Asia. In another achievement, Margarita Mamun, a Russian rhythmic gymnast of Bangladeshi origin, won gold medal in 2016 Summer Olympics and became world champion in the years 2013 and 2014. The cinema of Bangladesh dates back to 1898, when films began screening at the Crown Theatre in Dhaka. The first bioscope on the subcontinent was established in Dhaka that year. The Dhaka Nawab Family patronized the production of several silent films in the 1920s and 30s. In 1931, the East Bengal Cinematograph Society released the first full-length feature film in Bangladesh, titled the Last Kiss. The first feature film in East Pakistan, Mukh O Mukhosh, was released in 1956. During the 1960s, 25–30 films were produced annually in Dhaka. By the 2000s, Bangladesh produced 80–100 films a year. While the Bangladeshi film industry has achieved limited commercial success, the country has produced notable independent filmmakers. Zahir Raihan was a prominent documentary-maker who was assassinated in 1971. The late Tareque Masud is regarded as one of Bangladesh's outstanding directors due to his numerous productions on historical and social issues. Masud was honored by FIPRESCI at the 2002 Cannes Film Festival for his film The Clay Bird. Tanvir Mokammel, Mostofa Sarwar Farooki, Humayun Ahmed, Alamgir Kabir, and Chashi Nazrul Islam are some of the prominent directors of Bangladeshi cinema. Bangladesh have very active film society culture. its started in 1963 at Dhaka. Now around 40 Film Society active in all over Bangladesh. Federation of Film Societies of Bangladesh is the parent organization of the film society movement of Bangladesh. Active film societies include the Rainbow Film Society, Children's Film Society, Moviyana Film Society & Dhaka University Film Society. ^ "National Symbols→National march". Bangladesh Tourism Board. Bangladesh: Ministry of Civil Aviation & Tourism. Archived from the original on 28 December 2016. Retrieved 21 February 2015. In 13 January 1972, the ministry of Bangladesh has adopted this song as a national marching song on its first meeting after the country's independence. ^ a b "Article 3. The state language". The Constitution of the People's Republic of Bangladesh. bdlaws.minlaw.gov.bd. Ministry of Law, The People's Republic of Bangladesh. Retrieved 1 February 2017. ^ "Health Bulletin 2016" (PDF). Directorate General of Health Services (DGHS). p. 13. Archived (PDF) from the original on 13 June 2017. Retrieved 11 September 2017. ^ Data Archived 4 September 2011 at the Wayback Machine. Census – Bangladesh Bureau of Statistics. ^ a b c d "Report for Selected Country Groups and Subjects". World Economic Outlook Database. IMF. Archived from the original on 27 March 2019. Retrieved 22 March 2019. ^ "Gini Index". Knoema. Archived from the original on 7 September 2013. Retrieved 3 October 2018. ^ "Human Development Report 2018 – "Human Development Indices and Indicators"" (PDF). HDRO (Human Development Report Office) United Nations Development Programme. p. 34. Archived (PDF) from the original on 22 March 2017. Retrieved 15 September 2018. ^ Jha, Saurav (30 December 2016). "The Bay of Bengal Naval Arms Race". The Diplomat. Tokyo. Archived from the original on 6 September 2017. Retrieved 19 September 2017. ^ Frank E. Eyetsemitan; James T. Gire (2003). Aging and Adult Development in the Developing World: Applying Western Theories and Concepts. Greenwood Publishing Group. p. 91. ISBN 978-0-89789-925-3. Archived from the original on 14 February 2017. Retrieved 20 January 2017. ^ a b "Bangladesh's Constitution of 1972, Reinstated in 1986, with Amendments through 2014" (PDF). constituteproject.org. Archived (PDF) from the original on 3 January 2018. Retrieved 29 October 2017. ^ a b Bergman, David (28 March 2016). 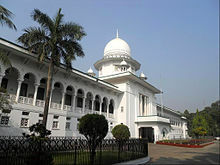 "Bangladesh court upholds Islam as religion of the state". Al Jazeera. Archived from the original on 30 March 2018. Retrieved 30 March 2018. ^ Steel, Tim (28 March 2015). "Wealth, trade, and Bangladesh". Dhaka Tribune. Archived from the original on 10 October 2017. Retrieved 19 September 2017. 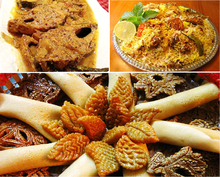 ^ "Bara-Bhuiyans, The – Banglapedia". en.Banglapedia.org. Archived from the original on 10 October 2017. Retrieved 19 September 2017. ^ a b "Isa Khan – Banglapedia". en.Banglapedia.org. Archived from the original on 7 March 2016. Retrieved 19 September 2017. ^ M. Shahid Alam (2016). Poverty From The Wealth of Nations: Integration and Polarization in the Global Economy since 1760. Springer Science+Business Media. p. 32. ISBN 978-0-333-98564-9. Archived from the original on 28 March 2019. Retrieved 28 March 2019. ^ a b Khandker, Hissam (31 July 2015). "Which India is claiming to have been colonised?". The Daily Star (Op-ed). Archived from the original on 27 August 2017. Retrieved 11 December 2015. ^ Lawrence E. Harrison, Peter L. Berger (2006). Developing cultures: case studies. Routledge. p. 158. ISBN 9780415952798. Archived from the original on 28 March 2019. Retrieved 28 March 2019. ^ "Special report: The Breakup of Pakistan 1969–1971". 23 September 2017. Archived from the original on 16 December 2017. Retrieved 16 December 2017. ^ "Notation of song aaji bangladesher hridoy". Archived from the original on 4 September 2015. Retrieved 10 September 2015. ^ a b Sen, Sailendra Nath (1999) [First published 1988]. Ancient Indian History and Civilization. New Age International. p. 281. ISBN 978-81-224-1198-0. ^ a b Ahmed, Salahuddin (2004). Bangladesh: Past and Present. APH Publishing. p. 23. ISBN 978-81-7648-469-5. Archived from the original on 23 December 2016. Retrieved 14 May 2016. ^ Sircar, D.C. (1990). Studies in the Geography of Ancient and Medieval India. Motilal Banarsidass. p. 135. ISBN 978-81-208-0690-0. Archived from the original on 10 June 2016. Retrieved 19 April 2016. ^ "Bangladesh: early history, 1000 B.C.–A.D. 1202". Bangladesh: A country study. Washington, DC: Library of Congress. September 1988. Archived from the original on 7 December 2013. Retrieved 1 December 2014. Historians believe that Bengal, the area comprising present-day Bangladesh and the Indian state of West Bengal, was settled in about 1000 B.C. by Dravidian-speaking peoples who were later known as the Bang. Their homeland bore various titles that reflected earlier tribal names, such as Vanga, Banga, Bangala, Bangal, and Bengal. ^ a b SenGupta, Amitabh (2012). Scroll Paintings of Bengal: Art in the Village. AuthorHouse UK. p. 14. ISBN 978-1-4678-9663-4. ^ Blood, Peter R. (1989). "Early History, 1000 B.C.–A.D. 1202". In Heitzman, James; Worden, Robert (eds.). Bangladesh: A Country Study. Washington, DC: Federal Research Division, Library of Congress. p. 4. Archived from the original on 22 June 2011. Retrieved 17 October 2010. ^ a b c Eaton, R.M. (1996). The Rise of Islam and the Bengal Frontier, 1204–1760. University of California Press. ISBN 978-0-520-20507-9. Archived from the original on 6 January 2017. Retrieved 20 June 2015. ^ Lewis, David (2011). Bangladesh: Politics, Economy and Civil Society. Cambridge University Press. p. 42. ISBN 978-1-139-50257-3. Archived from the original on 31 January 2018. Retrieved 16 July 2017. ^ Pieris, Sita; Raven, Ellen (2010). ABIA: South and Southeast Asian Art and Archaeology Index. Volume Three – South Asia. Brill. p. 116. ISBN 978-90-04-19148-8. Archived from the original on 23 December 2016. Retrieved 11 December 2015. ^ Hossain, Emran (19 March 2008). "Wari-Bateshwar one of earliest kingdoms". The Daily Star. Archived from the original on 30 June 2017. Retrieved 16 July 2017. ^ Olivelle, Patrick (2006). Between the Empires: Society in India 300 BCE to 400 CE. Oxford University Press. p. 6. ISBN 978-0-19-977507-1. Archived from the original on 3 September 2015. Retrieved 20 June 2015. ^ Ring, Trudy; Salkin, Robert M.; La Boda, Sharon (1994). International Dictionary of Historic Places: Asia and Oceania. Taylor & Francis. p. 186. ISBN 978-1-884964-04-6. Archived from the original on 6 January 2017. Retrieved 11 December 2015. ^ Hasan, Perween (2007). Sultans and Mosques: The Early Muslim Architecture of Bangladesh. I.B. Taurus. p. 32. ISBN 978-1-84511-381-0. Archived from the original on 31 January 2018. Retrieved 28 August 2017. ^ "Dhaka – national capital, Bangladesh". Encyclopædia Britannica. Archived from the original on 10 October 2017. Retrieved 19 September 2017. ^ Eaton, Richard M. (1996). The Rise of Islam and the Bengal Frontier, 1204–1760. University of California Press. ISBN 978-0-520-20507-9. Archived from the original on 6 January 2017. Retrieved 20 June 2015. ^ Samaren Roy (1999). The Bengalees: Glimpses of History and Culture. Allied Publishers. p. 72. ISBN 978-81-7023-981-9. Archived from the original on 31 January 2018. Retrieved 30 July 2017. ^ "Bengal". Encyclopaedia Iranica. Archived from the original on 30 September 2017. Retrieved 19 September 2017. ^ "Persian". Banglapedia. Archived from the original on 11 September 2017. Retrieved 21 September 2017. ^ "Railway – Banglapedia". en.Banglapedia.org. Archived from the original on 10 October 2017. Retrieved 19 September 2017. ^ Pranab Chatterjee (2010). A Story of Ambivalent Modernization in Bangladesh and West Bengal: The Rise and Fall of Bengali Elitism in South Asia. Peter Lang. p. 218. ISBN 978-1-4331-0820-4. Archived from the original on 31 January 2018. Retrieved 30 July 2017. ^ Kennedy, Bernard (December 2005). "Ambassador Rezaqul Haider: Mediating for commerce". Diplomat. Ankara, Turkey. Archived from the original on 10 October 2017. Retrieved 30 July 2017. After the First World War when the great leader Mustafa Kemal Atatürk started his war of independence, the people of Bengal were very spontaneous in giving all sorts of support. To the extent that there is evidence that the womenfolk donated their own bangles and gold ornaments, and the funds were used for the establishment of a bank, the construction of the parliament building and the purchase of armaments and ammunitions to help the war of liberation. As you know our national poet, Nazrul Islam, was the first foreigner to write an epic poem about Mustafa Kemal. ^ Soumyendra Nath Mukherjee (1987). Sir William Jones: A Study in Eighteenth-century British Attitudes to India. Cambridge University Press. p. 230. ISBN 978-0-86131-581-9. Archived from the original on 31 January 2018. Retrieved 30 July 2017. ^ Farahnaz Ispahani (2017). Purifying the Land of the Pure: A History of Pakistan's Religious Minorities. Oxford University Press. p. 8. ISBN 978-0-19-062165-0. Archived from the original on 31 January 2018. Retrieved 29 August 2017. ^ Yasmin Saikia (2011). Women, War, and the Making of Bangladesh: Remembering 1971. Duke University Press. p. 34. ISBN 978-0-8223-5038-5. ^ Ahmed, K. Anis (16 August 2017). "Opinion – Why Do Bangladeshis Seem Indifferent to Partition?". The New York Times. Archived from the original on 29 August 2017. Retrieved 19 September 2017. ^ Abdul Hannan (28 August 2017). "How Partition helped Muslims". Dhaka Tribune (Opinion). Archived from the original on 1 October 2017. Retrieved 19 September 2017. ^ David S. Lewis; Darren J. Sagar (1992). Political Parties of Asia and the Pacific: A Reference Guide. Longman. p. 36. ISBN 978-0-582-09811-4. Archived from the original on 31 January 2018. Retrieved 30 July 2017. "ts present name in December 1953"
^ Vale, Lawrence (2014). Architecture, Power and National Identity. Routledge. p. 291. ISBN 978-1-134-72921-0. Archived from the original on 6 January 2017. Retrieved 14 May 2016. ^ Terminski, Bogumil (2014). Development-Induced Displacement and Resettlement. Columbia University Press. p. 28. ISBN 978-3-8382-6723-4. Archived from the original on 14 February 2017. Retrieved 20 January 2017. ^ Salahuddin Ahmed (2004). Bangladesh: Past and Present. APH Publishing. p. 157. ISBN 978-81-7648-469-5. Archived from the original on 4 May 2016. Retrieved 29 August 2017. ^ Zafar Sobhan (17 August 2007). "Tragedy of errors". The Daily Star (Editorial). Archived from the original on 29 August 2017. Retrieved 19 September 2017. ^ Muscat, Robert J. (2015). Investing in Peace: How Development Aid Can Prevent or Promote Conflict. Routledge. ISBN 978-1-317-46729-8. Archived from the original on 14 February 2017. Retrieved 20 January 2017. ^ "Bangladesh – The "Revolution" of Ayub Khan, 1958–66". Archived from the original on 6 March 2016. Retrieved 11 December 2015. ^ Raic, D (2002). Statehood and the Law of Self-Determination. Martinus Nijhoff Publishers. p. 336. ISBN 978-90-411-1890-5. Archived from the original on 14 February 2017. Retrieved 20 January 2017. ^ Thomas, Raju G.C. (2003). Yugoslavia Unraveled. Lexington Books. p. 322. ISBN 978-0-7391-0757-7. Archived from the original on 14 February 2017. Retrieved 20 January 2017. ^ Syed Badrul Ahsan (2 June 2010). "The sky, the mind, the ban culture". The Daily Star (Editorial). Archived from the original on 22 December 2015. Retrieved 11 December 2015. ^ Bangladesh cyclone of 1991 Archived 26 August 2009 at the Wayback Machine. Britannica Online Encyclopedia. ^ "Bangladesh – Emerging Discontent, 1966–70". Archived from the original on 23 June 2011. Retrieved 11 December 2015. ^ Ray, Jayanta Kumar (2013). India's Foreign Relations, 1947–2007. Routledge. ISBN 978-1-136-19714-7. Archived from the original on 14 February 2017. Retrieved 20 January 2017. ^ Thorpe, Edgar (2012). The Pearson General Knowledge Manual. Pearson Education India. p. A.125. ISBN 978-81-317-6190-8. ^ Bass, Gary Jonathan (2014). The Blood Telegram: Nixon, Kissinger, and a Forgotten Genocide. Alfred A. Knopf. p. 50. ISBN 978-0-307-70020-9. That night [25 March] ... The Pakistani military had launched a devastating assault on the Bengalis. ^ Siegfried O. Wolf; Jivanta Schöttli; Dominik Frommherz; Kai Fürstenberg; Marian Gallenkamp; Lion König; Markus Pauli (2014). Politics in South Asia: Culture, Rationality and Conceptual Flow. Springer. p. 111. ISBN 978-3-319-09087-0. Archived from the original on 14 February 2017. Retrieved 20 January 2017. ^ Bates, Crispin (2013). Subalterns and Raj: South Asia Since 1600. Routledge. p. 191. ISBN 978-1-134-51375-8. Archived from the original on 14 February 2017. Retrieved 20 January 2017. ^ Pervez Musharraf (2008). In the Line of Fire. Simon and Schuster. p. 70. ISBN 978-1-84739-596-2. ^ Johnston, Faith (2013). Four Miles to Freedom. Random House India. ISBN 978-81-8400-507-3. Archived from the original on 14 February 2017. Retrieved 20 January 2017. ^ Totten, Samuel (2012). Plight and Fate of Women During and Following Genocide. Transaction Publishers. p. 47. ISBN 978-1-4128-4759-9. Archived from the original on 14 February 2017. Retrieved 20 January 2017. ^ "Bangladesh sets up war crimes court". Archived from the original on 16 December 2015. Retrieved 11 December 2015. ^ a b Benvenisti, Eyal (2012) [First published 1992]. The International Law of Occupation (2nd ed.). Oxford University Press. p. 190. ISBN 978-0-19-163957-9. Archived from the original on 14 February 2017. Retrieved 20 January 2017. The genuine and widely recognized claim for Bangladeshi self-determination as an entity independent of West Pakistan, coupled with the repulsion caused by the Pakistani measures to suppress that claim convinced global public opinion ... By the time its admission for membership in the United Nations came before the Security Council, in August 1972, Bangladesh had already been recognized by eighty-six countries. ^ "In Bangladesh, Ted Kennedy revered". Archived from the original on 22 December 2015. Retrieved 12 December 2015. ^ Nelson, Dean (19 October 2012). "Bangladesh to honour Bob Dylan and George Harrison". The Daily Telegraph. Archived from the original on 13 June 2018. Retrieved 18 June 2018. ^ "Joan Baez: Singing heroine of 1971 left out of Shommyanona list". The Opinion Pages. 10 April 2012. Archived from the original on 22 December 2015. Retrieved 12 December 2015. ^ Womack, Kenneth (2014). Beatles Encyclopedia, The: Everything Fab Four. ABC-CLIO. p. 200. ISBN 978-0-313-39172-9. Archived from the original on 14 February 2017. Retrieved 20 January 2017. ^ LaPorte, R (1972). "Pakistan in 1971: The Disintegration of a Nation". Asian Survey. 12 (2): 97–108. doi:10.1525/as.1972.12.2.01p0190a. ^ Rummel, Rudolph J. (1997) "Statistics of Democide: Genocide and Mass Murder Since 1900" Archived 21 February 2016 at the Wayback Machine. Transaction Publishers, Rutgers University. ISBN 3-8258-4010-7, Chapter 8, Table 8.2 Pakistan Genocide in Bangladesh Estimates, Sources, and Calculations Archived 4 February 2012 at the Wayback Machine. ^ Srinath Raghavan (2013). 1971. Harvard University Press. p. 247. ISBN 978-0-674-73127-1. Archived from the original on 14 February 2017. Retrieved 20 January 2017. ^ Sheikh Mujib's Return to Bangladesh – January 10, 1972 Monday. NBC. 23 December 2013. Archived from the original on 17 March 2016. Retrieved 21 December 2015 – via Centre for Bangladesh Genocide Research. ^ Lyon, Peter (2008). Conflict Between India and Pakistan: An Encyclopedia. ABC-CLIO. p. 192. ISBN 978-1-57607-712-2. Archived from the original on 14 February 2017. Retrieved 20 January 2017. ^ Syed Muazzem Ali (19 February 2006). "Bangladesh and the OIC". 15th Anniversary Special. The Daily Star. Archived from the original on 4 March 2016. Retrieved 21 December 2015. ^ Umar, Badruddin (1972). "Bangladesh nationalisation: What does it all mean?". Journal of Contemporary Asia. 2 (3): 328–30. doi:10.1080/00472337285390641. ^ a b c David Lewis (2011). Bangladesh: Politics, Economy and Civil Society. Cambridge University Press. ISBN 978-1-139-50257-3. Archived from the original on 6 January 2017. Retrieved 11 December 2015. ^ "Mushtaq was worst traitor: attorney general". bdnews24.com. Archived from the original on 10 October 2017. Retrieved 19 September 2017. ^ a b B.Z. Khasru. The Bangladesh Military Coup and the CIA Link. Rupa Publications India Pvt. Ltd. ISBN 978-81-291-3416-5. ^ "Bangladesh profile". BBC News. 13 August 2017. Archived from the original on 11 July 2018. Retrieved 19 September 2017. ^ Alam, Julhas (5 January 2014). "Fear for Bangladesh as 'Begums' fight forfuture power". Daily Express. London. Archived from the original on 17 November 2017. Retrieved 2 March 2018. ^ "Women and property rights: Who owns Bangladesh?". The Economist (Blog). 21 August 2013. Archived from the original on 7 December 2013. Retrieved 2 December 2013. ^ Torild, Skard (2014). Women of power: Half a century of female presidents and prime ministers worldwide. Policy Press. p. 135. ISBN 978-1-4473-1578-0. ^ "The Daily Star Web Edition Vol. 5 Num 1007". Archived from the original on 15 September 2018. Retrieved 10 November 2018. ^ "Former Bangladeshi PM arrested: reports". ABC News. 16 July 2007. Archived from the original on 22 September 2018. Retrieved 26 December 2018. ^ "Ex-PM sued on corruption charges in Bangladesh". International Herald Tribune. 12 February 2009. Archived from the original on 12 February 2009. Retrieved 26 December 2018. ^ Suvedī, Sūryaprasāda (2005). International watercourses law for the 21st century. Ashgate Publishing, Ltd. pp. 154–66. ISBN 978-0-7546-4527-6. ^ Ali, A (1996). "Vulnerability of Bangladesh to climate change and sea level rise through tropical cyclones and storm surges". Water, Air, & Soil Pollution. 92 (1–2): 171–79. doi:10.1007/BF00175563 (inactive 27 March 2019). ^ ""Bangladesh fights for survival against climate change", by William Wheeler and Anna-Katarina Gravgaard, The Washington Times". Pulitzercenter.org. 18 October 2009. Archived from the original on 21 August 2011. Retrieved 3 July 2010. ^ "National Web Portal of Bangladesh". Bangladesh Government. 15 September 2015. Archived from the original on 23 September 2015. Retrieved 23 September 2015. ^ a b c "Bangladesh". The World Factbook. Langley, Virginia: Central Intelligence Agency. 2012. Archived from the original on 20 July 2015. Retrieved 15 May 2007. ^ "Rangpur becomes a divivion". bdnews24.com. 25 January 2010. Archived from the original on 3 September 2015. Retrieved 6 August 2011. ^ a b c "2011 Population & Housing Census: Preliminary Results" (PDF). Bangladesh Bureau of Statistics. Archived from the original (PDF) on 15 January 2013. Retrieved 12 January 2012. ^ "Map Of Dinajpur". kantaji.com. Archived from the original on 13 July 2011. Retrieved 17 April 2015. ^ Alexander, David E. (1999) . "The Third World". Natural Disasters. Dordrecht: Kluwer Academic Publishers. p. 532. ISBN 978-0-412-04751-0. ^ Haggett, Peter (2002) . "The Indian Subcontinent". Encyclopedia of World Geography. New York: Marshall Cavendish. pp. 2, 634. ISBN 978-0-7614-7308-4. OCLC 46578454. ^ Bangladesh Climate Change Strategy and Action Plan, 2008 (PDF). Ministry of Environment and Forests Government of the People's Republic of Bangladesh. 2008. ISBN 978-984-8574-25-6. Archived from the original (PDF) on 7 October 2009. ^ Glennon, Robert. "The Unfolding Tragedy of Climate Change in Bangladesh". Archived from the original on 1 December 2017. Retrieved 23 November 2017. ^ Walker, Brian (21 June 2010). "Study: Millions in Bangladesh exposed to arsenic in drinking water". CNN. Archived from the original on 23 June 2010. Retrieved 3 July 2010. ^ "Bangladesh: 77 m poisoned by arsenic in drinking water". BBC News. 19 June 2010. Archived from the original on 23 June 2010. Retrieved 3 July 2010. ^ a b "Bangladesh – Country Profile". cbd.int. Archived from the original on 17 February 2015. Retrieved 16 February 2015. ^ a b Bangladesh | history – geography :: Plant and animal life Archived 3 February 2014 at the Wayback Machine. Encyclopædia Britannica. ^ "Flora and Fauna – Bangladesh high commission in India". Bangladesh High Commission, New Delhi. Archived from the original on 20 August 2013. ^ Soraya Auer; Anika Hossain (7 July 2012). "Lost Wards of the State". Star Weekend Magazine. The Daily Star. Archived from the original on 14 February 2015. Retrieved 14 February 2015. ^ Peter Haggett (2001). Encyclopedia of World Geography. Marshall Cavendish. p. 2620. ISBN 978-0-7614-7289-6. Archived from the original on 14 February 2017. Retrieved 20 January 2017. ^ "Bangladesh Sunderbans Wildlife Survey Finds New Species of Leopard". International Business Times UK. 28 March 2012. Archived from the original on 14 February 2015. Retrieved 14 February 2015. ^ a b "Bears in Bangladesh". Bangladesh Bear Project. Archived from the original on 14 February 2015. Retrieved 14 February 2015. ^ "6,000 Rare, Large River Dolphins Found in Bangladesh". National Geographic. March 2009. Archived from the original on 12 October 2014. Retrieved 13 February 2015. ^ Hossain, Muhammad Selim (23 May 2009). "Conserving biodiversity must for survival". The Daily Star. Archived from the original on 30 May 2015. Retrieved 30 May 2015. ^ Mastoor, Maryam. "Bangladesh's Political Turmoil 2006–08: An Analysis". ^ Shakhawat Liton (1 July 2011). "Highest punishment to state power usurpers". The Daily Star. Archived from the original on 10 October 2017. Retrieved 19 September 2017. ^ Shakhawat Liton; Rashidul Hasan (1 July 2011). "Caretaker system abolished". The Daily Star. Archived from the original on 10 October 2017. Retrieved 19 September 2017. ^ Sial, Omar (October 2008). "A Research Guide to the Legal System of the Peoples' Republic of Bangladesh". GlobaLex. Archived from the original on 5 September 2015. Retrieved 27 April 2015. ^ "The Military and Democracy in Bangladesh". press-files.anu.edu.au. Archived from the original on 10 October 2017. Retrieved 19 September 2017. ^ Bangladesh troops lead global peacekeeping Archived 1 June 2012 at the Wayback Machine. Retrieved 29 May 2012. ^ Including service and civilian personnel. See Bangladesh Navy. Retrieved 17 July 2007. ^ Armed Forces Division. "Ongoing Operations". afd.gov.bd. Archived from the original on 30 January 2015. Retrieved 16 February 2015. ^ "New Indian army chief General Bipin Rawat coming to Bangladesh Friday". bdnews24.com. Archived from the original on 10 October 2017. Retrieved 19 September 2017. ^ "What Can Be Expected From The India-Bangladesh Defence Deal?". Outlook India. Archived from the original on 10 October 2017. Retrieved 19 September 2017. ^ Balachandran, P.K. (12 April 2017). "Rivals India and China woo Bangladesh with aid totalling $ 46 b". Daily FT. Colombo. Archived from the original on 28 July 2017. Retrieved 27 July 2017. ^ Armed Forces Division. "Bangladesh in UN Mission". afd.gov.bd. Archived from the original on 30 January 2015. Retrieved 28 January 2015. ^ a b Sisodia, N.S. ; Naidu, G.V.C. (2005). Changing Security Dynamic in Eastern Asia. google.com.bd. ISBN 978-81-86019-52-8. Archived from the original on 6 September 2015. Retrieved 3 December 2015. ^ Hasib, Nurul Islam (1 February 2015) First Bangladesh-Japan foreign secretary-level talks on Feb 5 Archived 24 February 2015 at the Wayback Machine. bdnews24.com. Retrieved 27 April 2015. ^ "Chapter 4: How Asians View Each Other". pewglobal.org. 14 July 2014. Archived from the original on 15 October 2015. Retrieved 19 September 2017. ^ "Bangladesh". state.gov. Archived from the original on 11 June 2008. Retrieved 19 September 2017. ^ Rezaul Karim (11 June 2016). "Saudi wants active role of Bangladesh". The Daily Star. Archived from the original on 14 June 2016. Retrieved 15 June 2016. ^ "Indian papers back strong ties with 'trusted friend' Bangladesh". BBC News. 8 June 2015. Archived from the original on 1 January 2019. Retrieved 21 June 2018. ^ Mahfuz Anam (9 September 2017). "Rohingya crisis: A concern for the region". The Daily Star (Opinion). Archived from the original on 20 September 2017. Retrieved 19 September 2017. ^ "Rohingya aid from India, Morocco, Indonesia arrives". The Daily Star. 14 September 2017. Archived from the original on 17 September 2017. Retrieved 19 September 2017. ^ "India's push to save its cows starves Bangladesh of beef". Reuters. 2 July 2015. Archived from the original on 7 November 2017. Retrieved 19 September 2017. ^ Sheikh Shahariar Zaman (18 March 2014). "China biggest arms supplier to Bangladesh". Dhaka Tribune. Archived from the original on 19 September 2017. Retrieved 19 September 2017. ^ "Foreign Policy – Banglapedia". en.banglapedia.org. Archived from the original on 10 October 2017. Retrieved 19 September 2017. ^ "Judgment in Bangladesh-Myanmar Maritime Boundary Dispute – International Law Observer – A blog dedicated to reports, commentary and the discussion of topical issues of international law". internationallawobserver.eu. Archived from the original on 6 October 2017. Retrieved 19 September 2017. ^ Alam, Julhas (16 September 2017). "Bangladesh accuses Myanmar of violating its airspace". Daily Press. Associated Press. Archived from the original on 3 October 2017. Retrieved 19 September 2017. ^ Safi, Michael (11 September 2017). "Myanmar treatment of Rohingya looks like 'textbook ethnic cleansing', says UN". The Guardian. Archived from the original on 19 September 2017. Retrieved 19 September 2017. ^ "Bangladesh-Pakistan Bilateral Trade Statistics" (PDF). Dhaka Chamber of Commerce & Industry. Archived (PDF) from the original on 12 March 2017. Retrieved 19 September 2017. ^ "Bangladesh". U.S. Central Command. Archived from the original on 14 August 2014. ^ Haq, Naimul. "Bangladesh Opting for Peace Rather Than Nuclear Arms". IDN-InDepthNews. Archived from the original on 30 July 2016. Retrieved 19 September 2017. ^ Shamsul Huda Harun (2001). The Making Of The Prime Minister H.S. Suhra Wardy Inan Anagram Polity 1947–1958. Institute of Liberation Bangabandhu and Bangladesh Studies, National University. ISBN 978-984-783-012-4. ^ Bangladesh Archived 12 February 2015 at the Wayback Machine. Freedom House. Retrieved 27 April 2015. ^ "Bangladesh – Country report – Freedom in the World – 2016". freedomhouse.org. 27 January 2016. Archived from the original on 10 June 2016. Retrieved 12 May 2016. ^ "Democracy Index 2014: Democracy and its discontents" (PDF). The Economist. Archived (PDF) from the original on 1 February 2016. Retrieved 6 December 2015 – via Sudestada.com.uy. ^ "Bangladesh 98th among 162 countries". The Daily Star (Op-ed). 16 August 2014. Archived from the original on 22 December 2015. Retrieved 9 December 2015. ^ a b "Civil society, freedom of speech under attack in Bangladesh: UN". The Daily Star (Op-ed). 5 March 2015. Archived from the original on 22 December 2015. Retrieved 9 December 2015. ^ Ridwanul Hoque. "Clashing ideologies". D+C, development and cooperation. Archived from the original on 22 December 2015. Retrieved 21 December 2015. ^ Simon Whelan (7 January 2011). "British police trained Bangladeshi death squads". World Socialist Web Site. Archived from the original on 22 December 2015. Retrieved 9 December 2015. ^ a b "Bangladesh: Disband Death Squad". Human Rights Watch. 21 July 2014. Archived from the original on 22 December 2015. Retrieved 9 December 2015. ^ a b "Rights groups demand disbanding of RAB". Deutsche Welle. Archived from the original on 22 December 2015. Retrieved 9 December 2015. ^ Fariha Karim (10 May 2011). "Bangladeshi force trained by UK police 'allowed to kill and torture'". The Guardian. Archived from the original on 22 December 2015. Retrieved 9 December 2015. ^ "CHT Commission concludes Sixth Mission". Kapaeeng Foundation (Press release). Archived from the original on 30 January 2016. Retrieved 6 December 2015. ^ Suvojit Bagchi (3 December 2015). "Trouble brewing in Chittagong Hill tracts". The Hindu. Retrieved 9 December 2015. ^ "Secular state with state religion gives rise to ambiguities". The Independent. Dhaka. Archived from the original on 30 January 2016. Retrieved 9 December 2015. ^ Syed Zain Al-Mahmood (1 August 2013). "Bangladesh's Top Islamist Party Banned From Poll – WSJ". The Wall Street Journal. Archived from the original on 31 January 2016. Retrieved 9 December 2015. ^ Ashif Islam Shaon (27 April 2016). "Where does Bangladesh stand on homosexuality issue?". Dhaka Tribune. Archived from the original on 5 June 2017. Retrieved 30 May 2017. ^ Kevin Bales; et al. "Bangladesh". The Global Slavery Index 2016. The Minderoo Foundation Pty Ltd. Archived from the original on 13 March 2018. Retrieved 13 March 2018. ^ Bales, Kevin (2016). Blood and Earth: Modern Slavery, Ecocide, and the Secret to Saving the World (First ed.). New York: Spiegel & Grau. pp. 71–97. ISBN 978-0-8129-9576-3. ^ Siddharth, Kara (2012). Bonded Labor: Tackling the System of Slavery in South Asia. New York: Columbia University Press. pp. 104–22. ^ McGoogan, Cara; Rashid, Muktadir (23 October 2016). "Satellites reveal 'child slave camps' in Unesco-protected park in Bangladesh". The Telegraph. Archived from the original on 14 March 2018. Retrieved 13 March 2018. ^ "Bangladesh 14th most corrupt country". The Daily Star. 3 December 2014. Archived from the original on 2 December 2015. Retrieved 9 December 2015. ^ "Overview of corruption and anti-corruption in Bangladesh". U4. Archived from the original on 8 November 2015. Retrieved 9 December 2015. ^ "Bangladesh's per capita income $1,190". bdnews24.com. Archived from the original on 10 November 2015. Retrieved 17 February 2015. ^ "Remittance hits record $15.31b". The Daily Star. 3 July 2015. Archived from the original on 26 December 2015. Retrieved 25 December 2015. ^ "Bangladesh fiscal trade deficit balloons". Business Standard. 12 August 2015. Archived from the original on 8 December 2015. Retrieved 17 December 2015. ^ "The Nobel Peace Prize for 2006". Archived from the original on 19 October 2006. Retrieved 6 September 2017. ^ "BRAC in business". 18 February 2010. Archived from the original on 7 September 2017. Retrieved 6 September 2017. ^ "Bangladesh – Country Brief". World Bank. Archived from the original on 15 September 2007. Retrieved 17 December 2015. ^ "Bangladesh Gets first Credit Rating". The Daily Star. 7 April 2010. Archived from the original on 14 April 2016. Retrieved 7 April 2010. ^ "CIA – The World Factbook". Central Intelligence Agency. Archived from the original on 29 June 2011. Retrieved 8 August 2011. ^ "Countries by Commodity". FAOSTAT. Food and Agriculture Organization of the United Nations. 2013. Archived from the original on 13 November 2016. Retrieved 13 November 2016. ^ Golub, Stephen; Varma, Abir (February 2014). Fishing Exports and Economic Development of Least Developed Countries: Bangladesh, Cambodia, Comoros, Sierra Leone and Uganda (PDF) (Report). Swarthmore College. p. 23. Archived (PDF) from the original on 24 October 2014. Retrieved 17 February 2015. ^ Chevron Policy; Government and Public Affairs. "Bangladesh" (PDF). Chevron. Archived from the original (PDF) on 22 January 2016. Retrieved 23 January 2019. ^ Jack Detsch; The Diplomat. "Bangladesh: Asia's New Energy Superpower?". The Diplomat. Archived from the original on 29 December 2016. Retrieved 17 December 2015. ^ "The Financialexpress-bd". Old.thefinancialexpress-bd.com. 15 November 2015. Archived from the original on 22 December 2015. Retrieved 17 December 2015. ^ Hassan, Nazmul (26 March 2005). "Pharmaceutical Sector Growing Fast". Arab News. Archived from the original on 1 October 2015. Retrieved 30 September 2015. ^ Lane, EJ (13 February 2015). "Bangladesh's drug industry meets nearly all domestic demand, eyes exports". Fierce Pharma Asia. Archived from the original on 1 October 2015. ^ Lakshmi, Aiswarya (10 March 2015). "Bangladesh Mulls Investments in Shipbuilding". Marinelink.com. Archived from the original on 22 December 2015. Retrieved 17 December 2015. ^ "Palak: Once Walton may turn into private Hi-Tech Park". Dhaka Tribune. 16 October 2015. Archived from the original on 8 November 2017. Retrieved 17 December 2015. ^ Sajjadur Rahman (4 April 2014). "Bank assets go up on steady economic growth". The Daily Star. Archived from the original on 22 December 2015. Retrieved 17 December 2015. ^ "Internet growth hinges on local content, cheap phones". The Daily Star. 9 March 2014. Archived from the original on 18 February 2015. Retrieved 18 February 2015. ^ "Tentative Lists". Archived from the original on 5 July 2012. Retrieved 6 September 2017. ^ "Report for Selected Countries and Subjects". International Monetary Fund. Archived from the original on 19 September 2018. Retrieved 19 September 2018. ^ "Bangladesh Microfinance Statistics 2010" (PDF). Archived from the original (PDF) on 22 December 2015. Retrieved 14 December 2015. ^ Transport – Bangladesh Transport Sector Archived 7 January 2015 at the Wayback Machine. World Bank. Retrieved 27 April 2015. ^ Ethirajan, Anbarasan (4 September 2012). "Bangladesh pins hope on Chittagong port". BBC News. Archived from the original on 15 October 2018. Retrieved 21 June 2018. ^ "River Port – Banglapedia". en.banglapedia.org. Archived from the original on 7 September 2017. Retrieved 19 September 2017. ^ "Key Statistics". Bpdb.gov.bd. 13 August 2015. Archived from the original on 15 January 2016. Retrieved 17 December 2015. ^ Lall, Marie (2009). The Geopolitics of Energy in South Asia. Institute of Southeast Asian Studies. p. 143. ISBN 978-981-230-827-6. Archived from the original on 6 January 2017. Retrieved 14 May 2016. ^ "Rosatom to Build Bangladesh's First Nuclear Power Plant | Business". The Moscow Times. 3 October 2013. Archived from the original on 19 February 2016. Retrieved 17 December 2015. ^ Woody, Todd (12 May 2014). "Why Green Jobs Are Booming in Bangladesh". The Atlantic. Archived from the original on 6 February 2017. Retrieved 5 March 2017. ^ * World Health Organization; UNICEF. "Joint Monitoring Program". Archived from the original on 16 February 2008. Retrieved 20 October 2010. Data are based on National Institute of Population Research and Training (Bangladesh); Mitra and Associates (Dhaka); ORC Macro. Measure/DHS+ (Programme) (2005). Bangladesh Demographic and Health Survey, 2004. Dhaka. ^ "Bangladesh". The World Factbook. Central Intelligence Agency. Archived from the original on 20 July 2015. Retrieved 25 September 2013. ^ Kar, Kamal; Bongartz, Petra (April 2006). "Update on Some Recent Developments in Community-Led Total Sanitation" (PDF). Brighton: University of Sussex, Institute of Development Studies. Archived from the original (PDF) on 28 May 2008. Retrieved 28 April 2008. ^ "Dhaka, Bangladesh. 1985". Archived from the original on 11 March 2016. Retrieved 17 December 2015 – via YouTube. ^ "Bangladesh launches its first satellite Bangabandhu-1". The Times of India. 13 May 2018. Retrieved 15 May 2018. ^ "Bangladesh Atomic Energy Commission". Baec.org.bd. 22 June 2014. Archived from the original on 4 March 2016. Retrieved 17 December 2015. ^ "Bangladesh Best Destination for IT outsourcing". The Daily Star. 8 March 2015. Archived from the original on 16 August 2016. Retrieved 15 August 2016. ^ Lonely Planet's Best in Travel. Lonely Planet. 2011. ISBN 978-1-74220-090-3. Archived from the original on 24 February 1999. Retrieved 11 April 2018. ^ "Top 10 best value destinations for 2011". Lonely Planet. 2011. Archived from the original on 16 January 2017. Retrieved 11 April 2018. ^ a b c d e f "Travel & Tourism Economic Impact 2013: Bangladesh" (PDF). World Travel and Tourism Council. Archived from the original (PDF) on 7 October 2013. ^ "Bangladesh's Population to Exceed 160 Mln after Final Census Report". English.cri.cn. Archived from the original on 14 January 2012. Retrieved 6 August 2011. ^ "Bangladesh – population Archived 14 December 2010 at the Wayback Machine". Library of Congress Country Studies. ^ "Population density – Persons per sq km 2010 Country Ranks". Archived from the original on 24 October 2010. Retrieved 2 October 2010. ^ "Poverty & Equity Data Portal". world bank. Archived from the original on 27 December 2018. Retrieved 26 December 2018. ^ "The World Bank In Bangladesh". world bank. Archived from the original on 17 December 2018. Retrieved 26 December 2018. ^ "Background Note: Bangladesh" Archived 11 June 2008 at the Wayback Machine. Retrieved 11 June 2008. ^ Rashiduzzaman, M (1998). "Bangladesh's Chittagong Hill Tracts Peace Accord: Institutional Features and Strategic Concerns". Asian Survey. 38 (7): 653–70. doi:10.1525/as.1998.38.7.01p0370e. JSTOR 2645754. ^ "New Dhaka Jamatkhana seen as a symbol of confidence in Bangladesh – The Ismaili". theismaili.org. 10 October 2012. Archived from the original on 22 February 2015. Retrieved 22 February 2015. ^ Note on the nationality status of the Urdu-speaking community in Bangladesh Archived 22 February 2015 at the Wayback Machine. UNHCR – The UN Refugee Agency. ^ "Condition of English in Bangladesh". ESL Teachers Board. Archived from the original on 15 January 2013. Retrieved 21 October 2012. ^ Constitution of Bangladesh (As modified up to 17 May 2004), Part I, Article 5. ^ "'Stranded Pakistanis' living in camps in Bangladesh – in pictures". The Guardian. 11 August 2014. Archived from the original on 3 June 2016. Retrieved 9 June 2016. ^ "Why deadly race riots could rattle Myanmar's fledgling reforms Archived 5 January 2015 at the Wayback Machine". The Christian Science Monitor. 12 June 2012. ^ "3. The state language". minlaw.gov.bd. Archived from the original on 5 August 2017. Retrieved 12 May 2016. ^ "Bangladesh's Constitution in Bengali". Bangladesh Government Website. Archived from the original on 1 June 2013. Retrieved 1 July 2013. ^ S.M. Mehdi Hasan, Condition of English in Bangladesh: Second Language or Foreign Language Archived 8 June 2007 at the Wayback Machine. Retrieved 17 July 2007. ^ "Official Census Results 2011 page xiii" (PDF). Bangladesh Government. Archived (PDF) from the original on 3 September 2017. Retrieved 17 April 2015. ^ a b "Know Bangladesh". Government of Bangladesh. Government of Bangladesh. Archived from the original on 9 October 2018. Retrieved 10 October 2018. ^ "Muslim Population by Country". Pew Research. 27 January 2011. Archived from the original on 26 July 2013. Retrieved 23 October 2013. ^ "Community: Sufism in Bangladesh". Sufism Journal. Archived from the original on 21 August 2011. Retrieved 3 July 2010. ^ "১০ বছরে ৯ লাখ হিন্দু কমেছে". prothom-alo.com. Archived from the original on 24 December 2014. Retrieved 3 December 2015. ^ "Report on International Religious Freedom". U.S. Department of State. Archived from the original on 25 June 2017. Retrieved 24 June 2017. ^ Struggle for the Soul of Bangladesh Archived 2 April 2015 at the Wayback Machine. Tony Blair Faith Foundation (5 December 2014). Retrieved 27 April 2015. ^ a b c d T. Neville Postlethwaite (1988). The Encyclopedia of Comparative Education and National Systems of Education. Pergamon Press. p. 130. ISBN 978-0-08-030853-1. ^ "IUT is categorized as International University by UGC". UGC, Bangladesh. Archived from the original on 22 July 2013. Retrieved 23 June 2013. ^ "University Grant Commission (UGC)". Ministry of Education, Government of Bangladesh. Archived from the original on 1 December 2012. Retrieved 29 March 2008. ^ "Bangladesh Education for All". Centre for Research and Information. Archived from the original on 14 August 2017. Retrieved 7 October 2015. 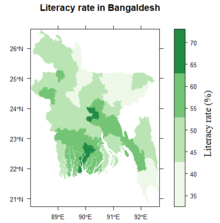 ^ "Bangladesh's literacy rate rises to 70 percent, education minister says". bdnews24. 16 June 2015. Archived from the original on 16 June 2015. Retrieved 7 October 2015. ^ a b Bhuiya, Abbas (June 2009). "Costs of utilizing healthcare services in Chakaria, a rural area in Bangladesh". FHS Research Brief (2). Archived from the original on 16 November 2012. Retrieved 18 May 2012. ^ Bloom, G; Standing, H.; Lucas, H; Bhuiya, A; Oladepo, O; et al. (2011). "Making Health Markets Work Better for Poor People: The Case of Informal Providers". Health Policy and Planning. 26 (Suppl 1): i45–i52. doi:10.1093/heapol/czr025. PMID 21729917. Archived from the original on 16 November 2012. Retrieved 26 May 2012. ^ Bhuiya, Abbas (September 2008). "Health Seeking Behaviour In Chakaria". FHS Research Brief (1). Archived from the original on 16 November 2012. Retrieved 18 May 2012. ^ Bhuiya, Abbas; et al. (2009). "Three methods to monitor utilization of healthcare services by the poor". Int J for Equity in Health. 8 (1): 29. doi:10.1186/1475-9276-8-29. PMC 2729304. PMID 19650938. Archived from the original on 16 November 2012. Retrieved 26 May 2012. ^ Aziz, Rumesa (November 2009). "A community health watch to establish accountability and improve performance of the health system". FHS Research Brief (3). Archived from the original on 16 November 2012. Retrieved 18 May 2012. ^ a b "Bangladesh statistics summary (2002–present)". Global Health Observatory Data Repository, WHO. Archived from the original on 15 April 2011. Retrieved 14 February 2012. ^ "Hospital beds (per 10 000 population)". UN Data. United Nations Statistics Division. 2005. Archived from the original on 14 November 2016. Retrieved 13 November 2016. ^ "Child and Maternal Nutrition in Bangladesh" (PDF). UNICEF. Archived (PDF) from the original on 6 September 2012. Retrieved 24 February 2012. ^ "Bangladesh has world's highest malnutrition rate". Owsa. oneworld.net. 24 November 2008. Archived from the original on 15 January 2012. Retrieved 14 February 2012. ^ "The state of food insecurity in the food 2011" (PDF). fao.org. Archived (PDF) from the original on 14 May 2012. Retrieved 24 February 2012. ^ "The State of the World's Children 2011" (PDF). UNICEF. Archived (PDF) from the original on 1 June 2012. Retrieved 24 February 2012. ^ "High Malnutrition in Bangladesh prevents children from becoming "Tigers"". Global Alliance for Improved Nutrition. 15 February 2011. Archived from the original on 15 September 2014. Retrieved 13 November 2016. ^ "Bangladesh Healthcare Crisis". BBC News. 28 February 2000. Archived from the original on 9 June 2012. Retrieved 14 February 2012. ^ "Bangladesh – Health". countrystudies.us. Archived from the original on 11 October 2011. Retrieved 14 February 2012. ^ "In Search of Bangladeshi Islamic Art". The Metropolitan Museum of Art, i.e. The Met Museum. Archived from the original on 12 August 2016. Retrieved 19 September 2017. ^ "Mahasthan Brahmi Inscription". Banglapedia. Archived from the original on 22 December 2015. Retrieved 17 December 2015. ^ Junaidul Haque (7 May 2011). "Rabindranath: He belonged to the world". The Daily Star. Archived from the original on 4 March 2016. Retrieved 17 December 2015. ^ Rubaiyat, Hossain. "Begum Rokeya : The Pioneer Feminist of Bangladesh". The Daily Star. Archived from the original on 15 August 2016. Retrieved 25 June 2016. ^ "Syed Mujtaba Ali". The Daily Star. 18 September 2009. Archived from the original on 22 December 2015. Retrieved 17 December 2015. ^ "World Bank Document" (PDF). World Bank. Archived (PDF) from the original on 3 March 2016. Retrieved 19 September 2017. ^ Rahman, Mahbubur (2012). "Architecture". In Islam, Sirajul; Jamal, Ahmed A. (eds.). Banglapedia: National Encyclopedia of Bangladesh (Second ed.). Asiatic Society of Bangladesh. ^ a b Ahmed, Syed Jamil (2000). Achinpakhi Infinity: Indigenous Theatre of Bangladesh. Dhaka: University Press Ltd. p. 396. ISBN 978-984-05-1462-5. ^ "UNESCO – The Samba of Roda and the Ramlila proclaimed Masterpieces of the Oral and Intangible Heritage of Humanity". UNESCO. Archived from the original on 3 March 2016. Retrieved 17 December 2015. ^ London, Ellen (2004). Bangladesh. Gareth Stevens Pub. p. 29. ISBN 0-8368-3107-1. ^ "Rock's leading light goes out". 18 October 2018. Archived from the original on 20 October 2018. Retrieved 10 November 2018. ^ "Traditional art of Jamdani weaving – intangible heritage – Culture Sector – UNESCO". UNESCO. Archived from the original on 9 December 2015. Retrieved 2 January 2016. ^ Ahmad, Shamsuddin (2012). "Textiles". In Islam, Sirajul; Jamal, Ahmed A. Banglapedia: National Encyclopedia of Bangladesh (Second ed.). Asiatic Society of Bangladesh. ^ "more Bibi Russell". Archived from the original on 22 July 2015. ^ "Bangladesh secure series victory". BBC News. 20 July 2009. Archived from the original on 22 December 2015. Retrieved 3 July 2010. ^ Polkinghorne, David (15 February 2015). "World's best all-rounder Shakib Al Hasan to kick-start Bangladesh's Cricket World Cup campaign at Manuka". The Sydney Morning Herald. Archived from the original on 17 February 2015. Retrieved 28 February 2015. ^ Star Live (12 June 2018). "Champions of Asia T20 Cup 2018: Bangladesh Women's Cricket Team". The Daily Star. Archived from the original on 29 August 2018. Retrieved 14 August 2018. ^ Faroqi, Gofran (2012). "Kabadi". In Islam, Sirajul; Jamal, Ahmed A. (eds.). Banglapedia: National Encyclopedia of Bangladesh (Second ed.). Asiatic Society of Bangladesh. ^ "All Affiliated National Federation/Association". National Sports Council. Archived from the original on 21 January 2013. Retrieved 25 January 2013. ^ "Bangladesh defeat Pakistan to win 2018 U15 SAFF Championships". Archived from the original on 5 November 2018. Retrieved 10 November 2018. ^ "Swadhin Bangla Betar Kendra's Rashidul Hossain passes away". bdnews24.com. Archived from the original on 29 December 2015. Retrieved 2 January 2016. ^ Ananta Yusuf (15 October 2015). "Watch Now: Rare books in ruins at Northbrook Hall". The Daily Star. Archived from the original on 18 December 2015. Retrieved 17 December 2015. ^ Rahman, Md Zillur (2012). "Library". In Islam, Sirajul; Jamal, Ahmed A. (eds.). Banglapedia: National Encyclopedia of Bangladesh (Second ed.). Asiatic Society of Bangladesh. Ahmed, Salahuddin (2004). Bangladesh: Past and Present. APH Publishing. ISBN 978-81-7648-469-5. Schendel, Willem van (2009). A History of Bangladesh. Cambridge University Press. ISBN 978-0-521-86174-8. Sisson, Richard; Rose, Leo E (1991). War and Secession: Pakistan, India, and the Creation of Bangladesh. University of California Press. ISBN 978-0-520-07665-5. Uddin, Sufia M. (2006). Constructing Bangladesh: Religion, Ethnicity, and Language in an Islamic Nation. University of North Carolina Press. ISBN 978-0-8078-7733-3. Wahid, Abu N.M..; Weis, Charles E (1996). The Economy of Bangladesh: Problems and Prospects. Praeger. ISBN 978-0-275-95347-8. Mojlum Khan, Muhammad (2013). The Muslim Heritage of Bengal: The Lives, Thoughts and Achievements of Great Muslim Scholars, Writers and Reformers of Bangladesh and West Bengal. Kube Publishing Ltd. ISBN 978-1-84774-052-6. Bose, Neilesh (2014). Recasting the Region: Language, Culture, and Islam in Colonial Bengal. Oxford University Press. ISBN 978-0-19-809728-0. Mohan, P.V.S. Jagan. Eagles Over Bangladesh: The Indian Air Force in the 1971 Liberation War. Harper Collins. ISBN 978-93-5136-163-3. Cardozo, Maj Gen Ian. In Quest of Freedom: The War of 1971 – Personal Accounts by Soldiers from India and Bangladesh. Bloomsbury India. ISBN 978-93-85936-00-5. Openshaw, Jeanne (2002). Seeking Bauls of Bengal. Cambridge University Press. ISBN 978-0-521-81125-5. Katoch, Dhruv C (2015). Liberation : Bangladesh – 1971. Bloomsbury India. ISBN 978-93-84898-56-4. Religion, identity & politics: essays on Bangladesh. International Academic Publishers. 2001. ISBN 978-1-58868-081-5. Belal, Dr Ataur Rahman (2012). Corporate Social Responsibility Reporting in Developing Countries: The Case of Bangladesh. Ashgate Publishing, Ltd. ISBN 978-1-4094-8794-4. Sogra, Khair Jahan (2014). The Impact of Gender Differences on the Conflict Management Styles of Managers in Bangladesh: An Analysis. Cambridge Scholars Publishing. ISBN 978-1-4438-6854-9. Riaz, Ali (2010). Political Islam and Governance in Bangladesh. Routledge. ISBN 978-1-136-92624-2. Grover, Verinder (2000). Bangladesh: Government and Politics. Deep and Deep Publications. ISBN 978-81-7100-928-2. Riaz, Ali; Rahman, Mohammad Sajjadur (2016). Routledge Handbook of Contemporary Bangladesh. Routledge. ISBN 978-1-317-30877-5. Bose, Sarmila (2012). Dead Reckoning Memories of the 1971 Bangladesh War. Hachette UK. ISBN 978-93-5009-426-6. Umar, Badruddin (2006). The Emergence of Bangladesh: Rise of Bengali nationalism, 1958–1971. Oxford University Press. ISBN 978-0-19-597908-4. Scholia has a topic profile for Bangladesh.